HOUSE OF 2 FLOORS TO RELEASE in center in CLOSED CONDOMINIUM of the Beach of CANASVIEIRAS-FLORIANÓPOLIS-BRAZIL. with FINANCING four FOREIGNERS. 2 Houses end Pool with land 1800 qm for Sale Pa Khiap Khu Mueang. The Houses are located in the beautiful rice farms with a lot of pure nature. This Gorgeous custom home constructed by R.E. Properties Ltd, is the first "Green" home in Grand Bahama built with "GreenBlock" material to LEED standards. The leading home in energy efficiency. Price reduced as motivated vendors wants sale NOW. Prestigious Oak Beach home with land. Close to the resort town of Port Douglas and only 40 minutes to Cairns. Ideal family home with other possibilities to explore. The Sea Horse Ranch is a luxury estate that features 51 acres of pristine pastures and a 5059 sq ft home that must be seen to believe! visit www.seahorseranchmaui.com for additional information. This beautiful house is situated on the seafront in Stoliv near the UNESCO protected Old Town of Kotor. It offers amazing sea views and to the opposite part of the bay where Perast is located. It is also overlooking two small islands. Well maintained 4 bedroom, 3 bathroom home. Two enclosed verandas. Metal grill bars and double swing grill gate for added security. Double car garage with electrical garage door opener. Many fruit trees such as coconut, orange, mango & ackee. Easy and convenient access to shops, schools, churches and service station. These homes can be built in various locations around the island. * Our signature series home is our benchmark of Homes incorporating some of the highest standard of quality and craftsmanship. Golf And Sandy Beaches - Luxury Homes In Paradise Island! Ocean Club Estates encompasses the eastern point of Paradise Island and is one of the newest and most exclusive oceanfront and golf-course communities in The Bahamas. Fri., Mar. 24 â€¢ 11:00 AM E.T. FEATURES: Newly renovatd four bedrooms, four bath majestic home with fine finishes throughout in a private gated cul-d-sac! This newly constructed luxury home is 50ft above sea level with some of the best views over the Atlantic Ocean and the Bahama outlying islands. Directly opposite across the sheltered waters of Moriah Harbour is a marine sanctuary, and this deserted island is a nursery of small fish with miles of white sands and lakes. This newly refurbished home consists of 9,500 sq. ft. of living space under air and sits on a 60,838 sq. 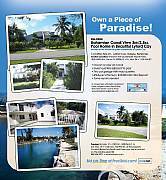 ft corner lot located within 1/2 mile of the site of the new "BAHAMAR" mega resort. visit for more details. The enclosed pool courtyard provides both privacy and security as well as the perfect surroundings for entertaining. Enjoy the year round tropical breezes and the quiet island lifestyle in this architectually distinctive estate, built over 22 feet above sea level and boasts a deep water dock. Just minutes from the Lucayan strip of hotels, shops, restaurants and casinos. Located in Grenada, one of the prettiest and most unspoiled Caribbean islands, my home offers knock-your-socks-off views from every room of the house: beach,ocean,tropical trees and lush plants,always; sailboats and windsurfers,occasionally; magnificent sunrises,daily. And most months the moon is low on the horizon and the reflection off the water is,quite simply,breathtaking. Majestic 5 bedroom/3 bath mountain lodge in the most sought after neighborhood of Kenscoff. Sitting proud on a vast 3 acre-land, it is surrounded by a landscape of exotic fruit trees (such as peaches, plums and apples), tall aromatic pine trees and an abounding vegetable garden. The property includes a hard-court Tennis Court that is completely fenced in with an adjoining practice wall. Ultra Modern House, mountain view site. Have a fresh air quality of life from the mountain sites. TAKE ADVANTAGE OF THE NEW PRICE OF THIS PROPERTY!! This home sits on the most magnificent 22,000 square feet lot (1/2 Acre) with an enchanting view of the town, luring you each morning from the Master Bedroom unto the cicular "Picture Patio". Cuxlin Ha is a new retirement/vacation community in Southern Belize. Well away from the hustle and bustle, but near town for shopping and other services. We are located in the heart of eco-tourism country, with ruins, waterfalls, caves and jungle walks all nearby. The fishing and diving are unbelievable, both reef and deep sea.